Steve’s upcoming EP “Come Up Clean” is now available for preorder on this site! Guest vocalist and Grammy award winner Jason Crabb is featured on the title track! Every preorder between now and release day (September 28) will be autographed! Preorder yours now at the store! Steve Ladd Inducted into The GMA Hall Of Fame! Steve Ladd signs with Sonlite Records! Heritage Of Gold Tour wins 2016 AGM Award! 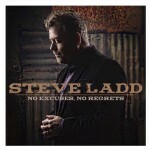 Steve Ladd nominated for Fan Favorite Artist Of The Year! Steve Ladd Strikes Gold For Miners With National Anthem!! !